We have developed a field control station (FCS) for the CENTUM CS 1000, a distributed control system for small- and medium-scale plants. Thus, in contrast to the FCSs of the CENTUM CS distributed control system for large-scale plants, these new FCSs are designed for small- and medium-scale plants. The main objective of their development was to make their architecture the same as the CENTUM CS's and to meet the requirements of the global market. While the CPU card, power supply card, VLnet coupler unit, and nest were newly developed, other components were either adopted from or made to be compatible with the CENTUM CS's in order to achieve the same architecture as the CENTUM CS. For example, the same input/output modules as those of the CENTUM CS are used, as well as a processor with a compatible object-oriented design and the VLnet, which has a logic sequence compatible with the CENTUM CS's Vnet. In order to make the system suitable for the global market, the hardware was made compact, low-priced, highly reliable, and easy-to-maintain as well as compliant to various international standards. The CPU card, power supply card, and VLnet coupler unit can be made dual redundant, and duplex configuration selected for each of these by the user. The development of the CENTUM CS 1000 distributed control system for small- and medium-scale plants was based on two basic design principles: 1) to have the same architecture as the CENTUM CS and 2) with the objective of becoming a global product. The main objectives for the development of the FCSs were compactness, high reliability and easy maintenance. FCSs are connected to each other and to human interface stations (HISs) and other stations and gateways via VLnet. Communication over the VLnet enables FCS databases to be downloaded and the various settings of an FCS to be set and read from an HIS. It also enables an HIS to be notified of alarms by the FCSs. FCSs are equipped with a number of different input/output (I/O) modules that connect the various analog and digital input/ output signals as well as general-purpose communication lines such as RS-232C to the FCS. The signals acquired by the I/O modules are subjected to input processing, control computation, logic operations, and then output processing before they are finally output from the FCS's I/O modules. The FCS of the CENTUM CS 1000 has the same architecture as those of the CENTUM CS distributed control system for large-scale plants. As a result, the user can build up a system based on the same architecture for whatever scale of plant in order to best meet the needs of their plant. The compatible system architecture also means that the engineering work required for building up systems, operation, and maintenance where both the CENTUM CS and CENTUM CS 1000 systems are used, is simple due to the commonly used parts and consistent functionality. 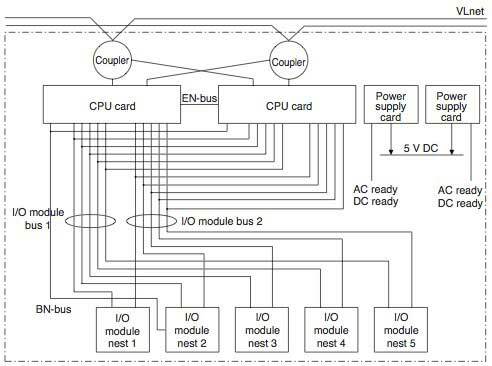 To make the hardware compact, the system is distributed at the control bus level thereby omitting the remote communication I/O bus used in the CENTUM CS. Further, the CPU card, power supply card, communication interface (VLnet interface), and I/O modules are installed in the same nest so that the CPU card can access the I/O modules directly. In addition to using the field-proven parts of CENTUM CS systems, each unit is made redundant for better reliability. The system is configured so that the CPU card, power supply card, VLnet interface, and input/output bus can be all made redundant, with all but the input/output bus requiring the redundancy specification to be selected by the user. Two CPU cards run at the same time to form a synchronous hot standby system. While the system is running, the standby processor card performs control computations synchronously with the currently running processor card. Hence, control is always present even when switching between the duplexed control processors. The power supply cards are made redundant by having the +5-V outputs from the two power supply cards pass through the diodes inside the cards and coupled on the backboard. 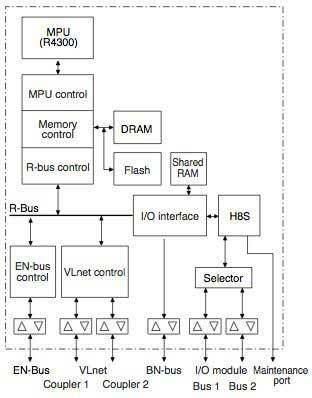 The VLnet interface and input/output bus have the same system of redundancy. Two bus lines are used alternately and an error check is made each time. Upon detection of an error, the problematic line is disconnected and a message raised to the user that explains how to remedy the problem. When all units are redundant, the only non-redundant portions are the main power distribution board and the part of the switching circuit for duplexed CPU cards. This ensures high reliability. The FCS do not need cooling fans. Therefore, FCSs do not require fans to be replaced or the fan filters to be periodically cleaned or replaced. Except for the backboard, all parts are replaceable from the front, thus facilitating replacement of parts during maintenance. Besides this, all redundant units are hot swappable, that is, they can be replaced without turning off the power or interrupting the control. The size and mounting space of an FCS are designed such that the FCS can be mounted on a 19-inch rack in the same way as the rack mountable units of the CENTUM CS. Throughout the design phase, a great deal of consideration was given to the impact on the global environment. This contributed to the compact space-saving design, low power consumption, and the adoption of base materials that are less harmful to the environment, e.g., materials that easily decompose. The total emission of CO 2 over the life cycle from base materials through to manufacturing and finally discarding it, was calculated. The results showed that CO 2 emission can be reduced by 35% from that of the same scale conventional products. BN-bus connecting a general-purpose communication module nest (AMN51) to the CPU cards. The BN-bus enables a simple communication nest to be used in the CENTUM CS 1000 to achieve the same high-speed general-purpose communication that required the CENTUM CS to be have a nest with dedicated power supply units and RIO bus communication units. The details of each module are given below. This R4300 microprocessor unit with built-in cache and 16- megabit DRAM achieves high-speed processing at a low cost. Its low 3.3-V power supply and DRAM has decreased power consumption as well as heat dissipation. The 3.3-V self- refreshing DRAM has also allowed a smaller-capacity battery unit than those of earlier models to be used, helping to achieve the more compact design. A flash memory is employed to store the boot program. This means that ROM need not be prepared during manufacturing and replacement of the ROM due to changes in the program as the boot program can be written into the flash memory that is mounted on the printed board. The MPU load for accessing the I/O modules has been de- creased by the following: having the H8S one-chip microcomputer access the I/O modules and structuring the data and statuses of the I/O modules in the shared RAM. The MPU can then read these data statuses from the shared RAM as necessary. This H8S one-chip microcomputer has a maintenance port, which is used during development, preparation for shipment, inspections, and maintenance to improve the efficiency in each phase. For example, the control for writing the program to the flash memory can be run via this H8S one-chip microcomputer during maintenance. The redundancy architecture of the CPU is referred to as a synchronous hot standby system, which is fundamentally the same as that of the CENTUM CS, the only difference being the addition of the new error detection and protection functions. These functions set write-protected areas in each CPU card to protect the program and database areas against illegal address- writing instructions from the other CPU card, and thereby prevent both cards from failing due to illegal accesses caused by malfunctions in the MPU. Other newly added functions include the memory management unit (MMU) and write-protection which ensure data integrity, the parity check of addresses and data, the ECC memory, and a two-wire signal self-checker. The power supply card is designed to supply power to the common nests, such as the CPU cards, and up to five I/O module nests. Standardizing the output voltages to +5 V DC has simplified the circuit and structure and reduced the number of parts. This allowed a power-factor improvement unit to be built in so as to comply with the aforementioned EN61000-3-2, Class A standard (relating to power line harmonics). The +5 V DC outputs from the two power supply cards pass through diodes so that they can be coupled externally for redundancy purposes. The input-voltage monitoring signal (AC ready) and output- voltage monitoring signal (DC ready) together with the guaranteed retention time of the +5-V DC output, enable control to continue over a temporary power failure. The output-voltage retention time immediately after a power failure is clearly defined in the specifications since it is closely related to the software- saving process in the CPU card. In order to meet the needs of global markets, three models have been prepared to cater for differing input power supply voltages: namely, a 100-120 V AC input model, a 220-240 V AC input model, and a 24 V DC input model. The connector unit used in the VLnet coupler was designed to be interchangeable with the connector unit for the Vnet. Hence, these new FCS models will be able to be connected to the Vnet and added to the lineup of CENTUM CS system components, by simply changing the connector units to those for the Vnet. The FCS nest is composed of VLnet couplers, battery units for backing up the CPUs' main memory, a backboard, a power distribution board, and a ready signal output unit in addition to the CPU cards and power supply cards. A standard FCS model has two I/O module nests. An optional version having five I/O module nests is also available. Functions are integrated in the newly developed gate array, and the microprocessor, A/D conversion IC, and other parts used in the AAM11 and AAM51 modules are removed. A double-layer board is adopted for the printed circuit board due to the simplified circuit and reduced number of parts. Parts are carefully assessed and chosen in consideration of overseas production capabilities. To achieve a high degree of reliability in spite of the short development period, the parts and circuits field-proven in the CENTUM CS system have been used as far as possible and sufficiently reviewed and assessed in terms of their temperature derating. By using the same I/O modules and module nests as the CENTUM CS, the same level of the reliability as the CENTUM CS can be assured for the very first batch of deliveries. 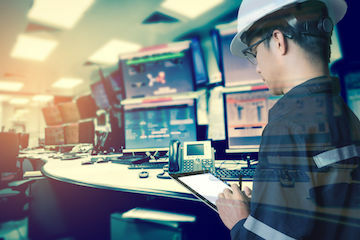 In regard to maintainability, this system configuration eliminates the need for users to have so many different spare parts and learn the different maintenance procedures, thus reducing the maintenance costs. The development of the CENTUM CS 1000 was accomplished in a short period of time by using the parts and technologies field-proven in the CENTUM CS system wherever possible. It is a low-end model in the CENTUM CS series and shall act as a key product for the global market-taking over from the μ XL systems. The CENTUM series hardware has identical architecture for plants of all scales. We shall continue to pursue cost reductions, increased system connectivity, and compliance with new standards in accordance with the demands of the market. The CENTUM CS 1000 must be assessed and updated so as to meet the ever-increasing market needs.